It is now apparent that the Fed (and bullion bank cartel) has kept the markets orderly (stable dollar, strong stock market and lower metals) for far longer than we thought possible. I’d peg JPMorgan at 80,000 contracts net long, based upon big net buying in the producer/merchant category of the disaggregated report, which flipped to net long for the first time in my memory. At 80,000 contracts net long, JPMorgan controlled 24.5% of the entire net open interest in COMEX gold futures after spreads are deducted from open interest. Even more shocking is that JPMorgan holds 51.5% of all long gold commercial contracts on the COMEX, the largest precious metals exchange in the world. It is not possible that these market shares do not constitute price manipulation. This will end badly for the (short) technical funds. Gold is not dead and the fundamentals for silver have never looked better. The current low prices are not a threat to your holdings; they are a blessing for those of you who are still on the sidelines. I can’t tell you the ultimate bottom (if we haven’t already seen it today); but I can tell you JPMorgan and the commercials are not buying to sell those contracts lower still. Along with the temporarily dormant investment demand in the West, that portends much higher prices to come. Even if you guess that prices will fall lower as JPMorgan rigs prices lower in order to buy, there is a terminal point. That point is closer than ever before. *The large specs increased their long positions by 584 contracts and increased their shorts by 4,093. *The commercials reduced their longs by 4,257 contracts and reduced their shorts by 5,293 contracts. *The small specs increased their longs by 2,904 contracts and increased their shorts by 531 contracts. *The large specs decreased their long positions by 7,439 contracts and increased their shorts by 14,126 contracts. *The commercials increased their longs by 5,905 contracts and decreased their shorts by 17,374 contracts. *The small specs increased their longs by 163 contracts and increased their shorts by 1,877 contracts. If you are worried and losing sleep over the low silver and gold prices and want to understand JPMorgan’s role in the manipulation of both, then here is the link to the Butler Research LLC newsletter: (http://www.butlerresearch.com). Butler’s information is original and is the place to go for easy to understand analysis of the COT (Comex data). He not only gives you the “numbers,” he explains where they stand historically and what it means for the price, going forward. Larry Edelson is holding his ground. For the last couple of months, he says gold bottoms in January, after which the bull market will resume with a vengeance. As bearish as he has been this year, he is now swinging over to a very bullish stance. His $5,000 price target for gold is even higher than Sinclair’s target of $3,500. If you want to get down to basics, the price of gold can’t stay below the cost of production for long. That is the best gauge of how low it will get. What is the cost of production? As we showed back in April, the marginal cost of production of gold (90% percentile) in 2013 was estimated at between $1250 and $1300 including capex. Which means that as of a few days ago, gold is now trading well below not only the cash cost, but is rapidly approaching the marginal cash cost of $1125… Of course, should the central banks of the world succeed in driving the price of gold to or below its costs of production (repressing yet another asset class into stocks) then we fear the repercussions will backfire from a combination of bankruptcies, unemployment, and as we have already seen in Africa – severe social unrest (especially notable as China piles FDI into that region). Here is what Jeff Clark had to say about the “end” of the bull market. The latest figures show that net Chinese gold imports through Hong Kong accelerated in October to 131.2 tonnes (4.2 million ounces), making it the seventh month this year China has imported over 100 tonnes (3.2 million ounces) of gold and the sixth in a row. Total YTD imports now stand at 967 tonnes (31.0 million ounces). Though there are no data for November available yet, it’s certain that Chinese imports have reached the 1,000-tonne (32.1 million ounces) figure, forecasted by both the WGC and GFMS earlier this year. It’s now estimated imports through Hong Kong this year will be more like 1,200 tonnes (38.5 million ounces). Hong Kong is not the only route for gold imports, as Shanghai is another big source. Some analysts estimate that gold imports from all sources, combined with domestic gold production of 420-430 tonnes (13.5-13.8 million ounces), will be in the range of 2,400-2,500 tonnes (77.1-80.3 million ounces). 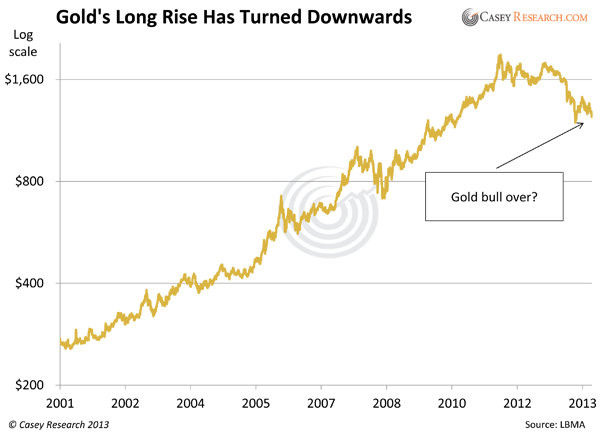 This is over 80% of the latest estimates of world new gold output this year of 2,900 tonnes (93.2 million ounces).